This large scale enterprise IT project had started several months previous to my involvement. 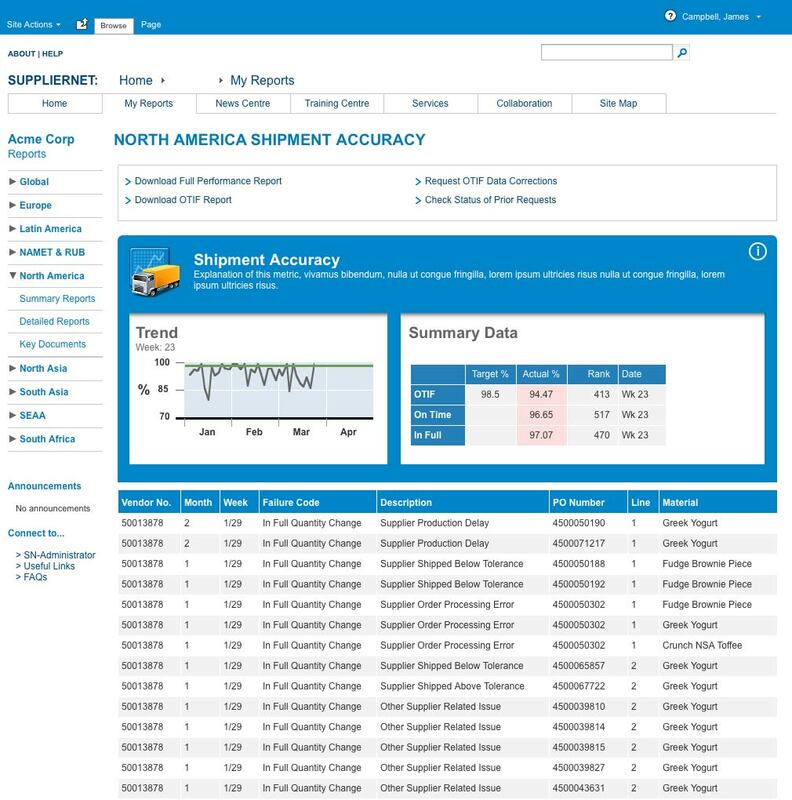 The intention was to build an Extranet for 300+ suppliers to enable direct and more efficient support and communications but most important to automate the production and distribution of supplier performance information. I was asked to re-design the user-interface for the suppliers as the previous design was not well received. It took some time to understand the size scope and technologies involved but one of the early UX breakthroughs came when I created the following user-journey, (even though it was simple). For the first time all the project stakeholders had a high level overview of what this project was really about and placed the suppliers (target users) central to the solution. 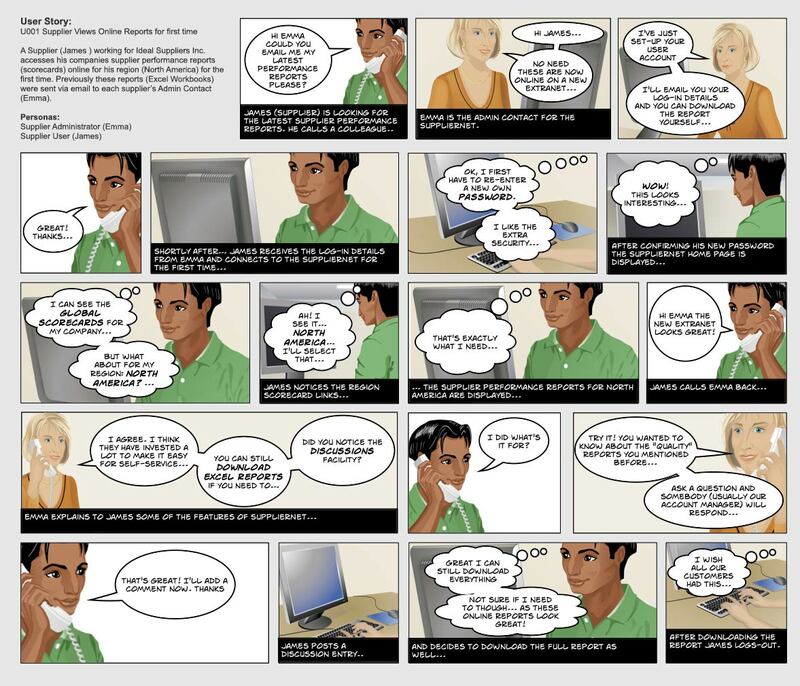 This was before any UX design but after we had established personas and user stories. The technical solution was already agreed: Sharepoint for the Extranet, SAP in for supplier transactions and SQL Server Reporting Services for charts. However, critical to the user experience would be the design and development of supplier scorecards that visually and simply communicate performance information to non-technical users. I created an number of concept validating with development these could be built based upon the data available and technology agreed. After initial concepts the designs were approved and I created (using Axure) a complete interactive prototype (pre-visualisation) for the entire solution. This evolved through several iterations as new features were added including the Sharepoint interface, and other functionality required. The visual elements (icons) were created with Adobe Illustrator and Photoshop (to created optimised web-ready images). The Extranet was launched on-time and several suppliers enrolled to go-live on the first release. Project Stakeholders reported they were very impressed that they “experienced” a fully interactive prototype using realistic data many months before the delivery of production software. Suppliers reported the SupplierNet was a huge time-save for them and appreciated the new communications channel it enabled.